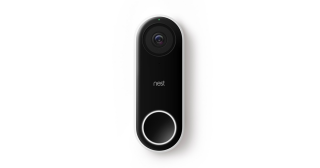 The Nest Hello Doorbell lets you say hello, even when you can't. HD talk and listen reduces ambient noise so that visitors can be heard loud and clear. And when you can't answer, quick responses let you reply to visitors with different pre-recorded messages. Nest Hello can tell the difference between a person and a thing, then alert you. With Nest Aware, it can also let you know if it spots a stranger or someone you know.